As you probably know by now, Adm. John Harvey of Fleet Forces Command on Thursday unveiled the results of his investigation into the controversial “XO Movie Night” video skits aired on the carrier Enterprise from 2005 to 2007, recommending that secretarial letters of censure be issued to two admirals and two of the carrier’s former executive officers — including Capt. Owen Honors, who as XO played a primary role in most of the questionable productions. What ashame! Capt Ron Horton was a great XO in Lincoln and I had the pleasure of working directly with him on several occasions. It’s getting a little crowded under that bus now. Even some silver stars. I wonder if the person that first leaked this whole sordid tale to the media is happy with all these careers that are wrecked now. Best solution to this injustice is to name CVN-79 the USS Owen Honors! 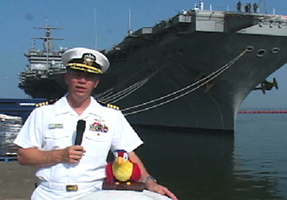 If the Navy’s investigation is true and not political then EVERYONE up to and including the CNO should be fired, because the CNO obviously “failed to lead” his direct reports, who failed to lead their direct reports, who failed to lead their direct reports, who failed to stop the “politically incorrect” videos of Capt Horton. Now what I really what to know is what happen to the poor little sailor who reported this, did that person get fired too to ruining all of the senior leadership’s careers and wasting untold sums of money and lost talent? Nah I doubt it, that person probably got a Navy Cross! These are the results when diversity is our number one…… only…. priority. Still just another foolish witch hunt, led by the politically correct excuse that now passes for Navy leadership! Even having been retired for a while now, I can’t believe the number of people that defend the videos. Even when I was on active duty and on a carrier, these would have been in appropriate regardless of what the crew thought. I’m mostly surprised at the absence of comments from the CMC and CPO Mess to the XO advising him of that fact after the first video aired. While I’m not a fan of trying to “connect the dots” to administer punishment considering the length of time that has passed, most of what the report says seems to be logical in terms of punishment doled out. I agree wholeheartedly with SCPO-SW-Ret. The CPO Mess should have stepped up and squashed the whole ordeal before it even started. The videos were a good idea right up to the point were it became obvious that they crossed the line. Where was the CMEO in all this? I just can’t see a CPO Mess, especially one that large endorsing the behavior… It is very disturbing.